When I put the itinerary together for a week in Ireland, I decided that a couple of days in the country’s capital at the beginning of the trip would allow us to adjust to the time zone before getting behind the wheel of a car. You’re welcome, citizens of Ireland. (I would especially recommend this approach to anyone who isn’t used to driving on the other side of the road – please don’t try to drive when you’re jet-lagged if you can avoid doing so!) 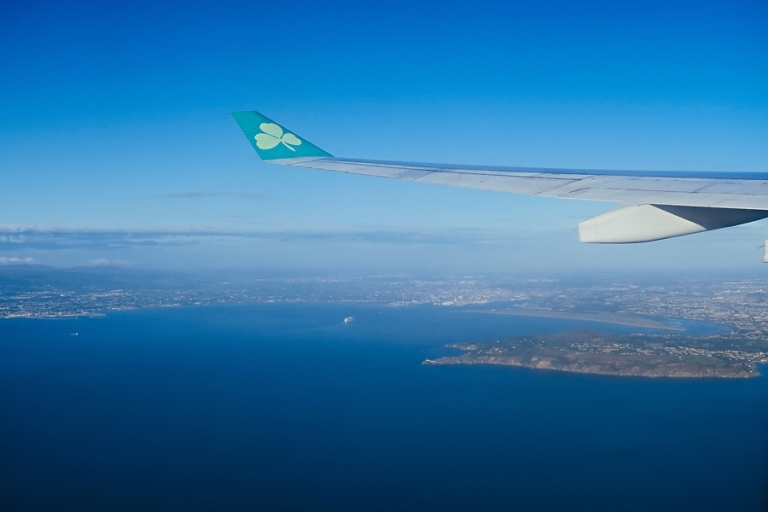 Besides, Dublin looked like somewhere we’d enjoy exploring, so we parked ourselves there for two full days. 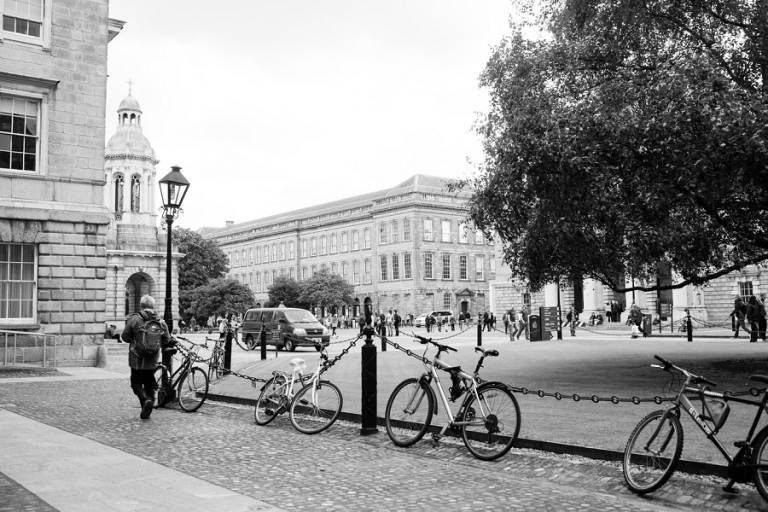 After landing in Dublin and getting settled at our hotel (we stayed at the Radisson Blu Royal; a fantastic hotel in a perfect city-center-but-quiet location), Chris and I had two things on our minds: exploring the city, and eating lunch. Being food-driven and hungry from travel, lunch won as the priority. Our fun cab driver from the airport highly recommended a popular chipper just blocks away from our hotel as the best place for fish and chips in the city. We were sold and headed to Leo Burdock to join the likes of Ray Charles, Lisa Kudrow, and “Justin Timberlake’s Parents” as patrons. I mean, if it’s good enough for the Timberlakes, it’s good enough for us, right? Note: The food is excellent, but portions are huge! We could have easily split one meal. 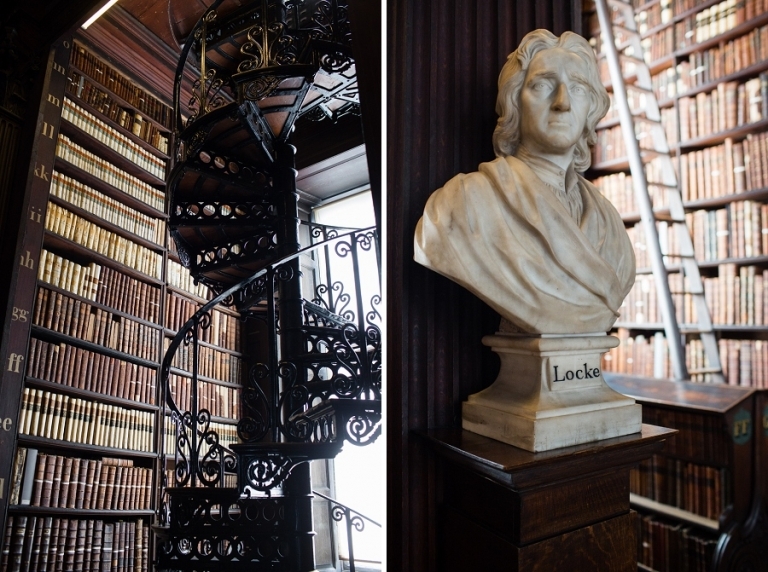 With full bellies and a goal to stay up late enough to conquer our jet lag (we made it to exactly 7:45pm), we set off to wander the city and cover a few planned highlights, starting with Trinity College. 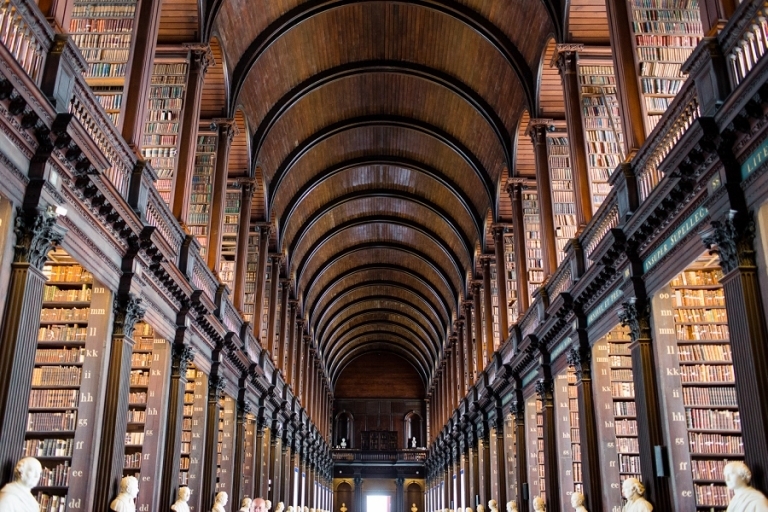 As an avid reader and book lover, I enjoyed getting a peek at the Book of Kells, but the highlight for me was visually perusing the treasures of the gorgeous Long Room library. We booked advance tickets online which allowed us to skip the queue at the door. They also let us in hours ahead of our scheduled time when we arrived earlier than we planned. And on a Friday afternoon in late August, the crowds were totally manageable. I have to come clean though: when it comes to big cities, I harbor some pretty polarizing love-hate feelings. Now, hate is a strong word and it’s not quite the right word, but I tend to get a little overwhelmed in crowds so I often feel a bit awkward and out of place in larger cities. I’m also (apologies to any smokers) really really not a fan of breathing second-hand smoke, which is difficult to avoid in the city. I’m pretty sensitive to it and I get headaches. As for the love side though, I savor the ample people-watching opportunities. And I have such a great time photographing city details: architecture (oh, the architecture in Dublin! ), people, signage, doors…I could spend the rest of my life in Dublin and not capture all of the wonderful interesting details. Up next, we drink our way through Dublin via Irish coffees and pouring the perfect pint of Guinness!